Note: It's important to check the TIME CHART (below) this month. Many locations (Europe, Asia, S. America, Mexico, Australia) will be 1 hour earlier this month due to seasonal time changes that take place on different dates in different countries. 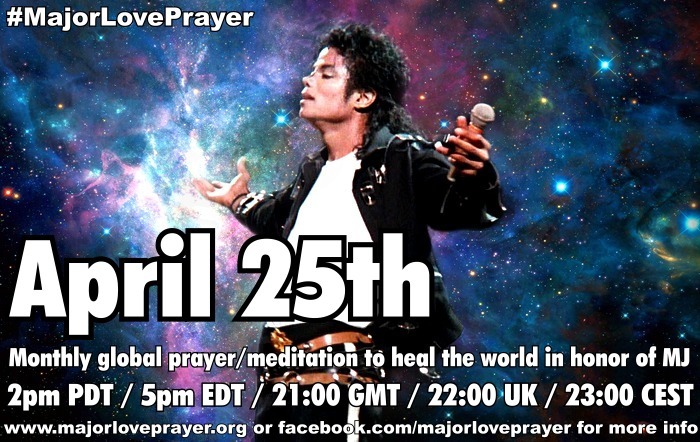 Dear #MJFam ~ This coming Monday, March 25th, we will again be uniting at the same moment worldwide for #MajorLovePrayer - a special moment of global spiritual unity and healing that happens every 25th in honor of #MichaelJackson. This will be the 115th month that we have joined together, SENDING OUT A MAJOR LOVE! 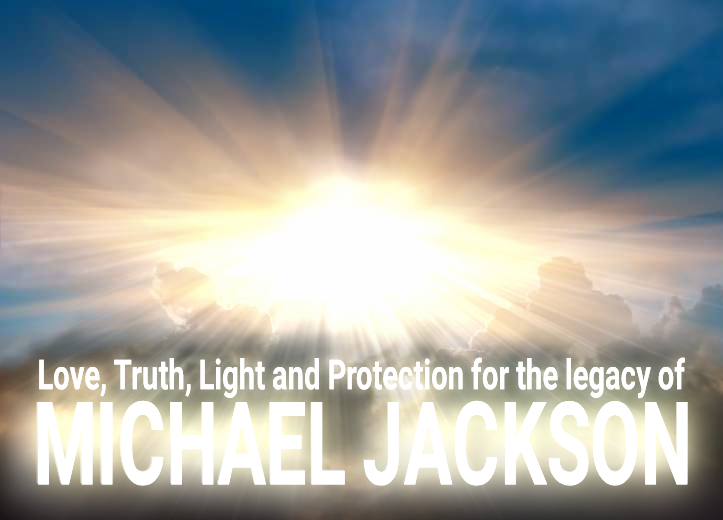 As we did last month, we're going to begin this MLP by first focusing on/calling forth a powerful LIGHT of TRUTH from Above, to help all people see through lies and deception and to provide an invincible light of PROTECTION all around Michael's NAME and LEGACY. Then, with all our love, we'll expand it into a global wave of major, major, MAJOR LOVE that will bring HEALING, HOPE, PEACE & POSITIVE ENERGY to our planet and all living beings! 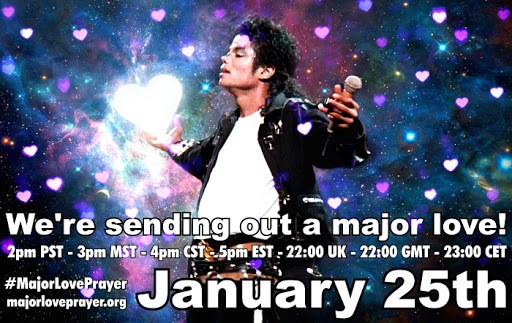 ~ ~ ~ 3) *GLOBAL GRID OF LOVE* - ♥♥♥ Next it's time to connect and send out a major love (like we do every month)! We are together right now, holding this light for Michael across the world, on every continent, in every country, in every realm, so reach out with all that LOVE in your heart to your brothers and sisters across the planet. 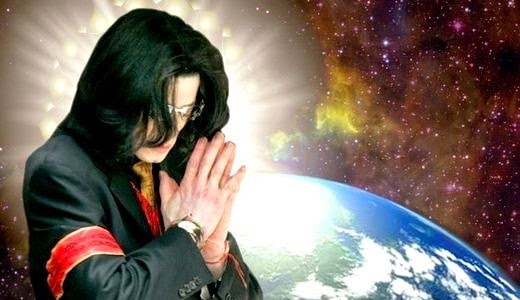 We reach out our hands spiritually to each other and encircle the Earth with a connected global grid of MAJOR LOVE, each of us a shining point of light and love energy. We are not far away. WE ARE ONE, as the Earth is ONE. As LOVE makes everything ONE in higher consciousness. Now, IF you can focus for longer or more often, that's absolutely wonderful. If you can only join the first prayer at the beginning, that's still wonderful. The HBO one(s) will be very late in some countries, and many of you want to be on Twitter defending him there as well, so we're just going to aim for INTENSE, LOVE-FILLED BURSTS OF MAGNIFIED LIGHT AND PROTECTION! 1) First, fill up with LOVE. Breathe slowly and deeply. Focus your heart in LOVE as much as you can - breathing it, feeling it, allowing your energy to become one with PURE LOVE. Don't focus on worry, fear or anger. Try to let that go for now. 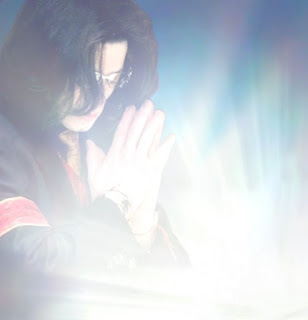 Just be full of love - for Michael, your loved ones, a Higher Power. Invite LOVE, compassion, giving and truth into your heart. 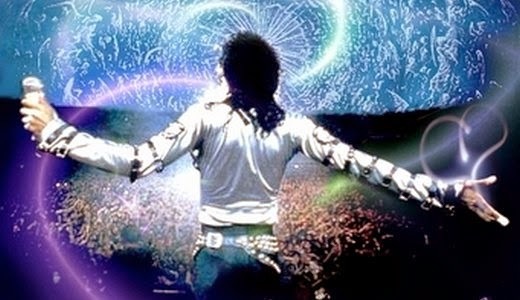 2) Next, visualize Michael's NAME. 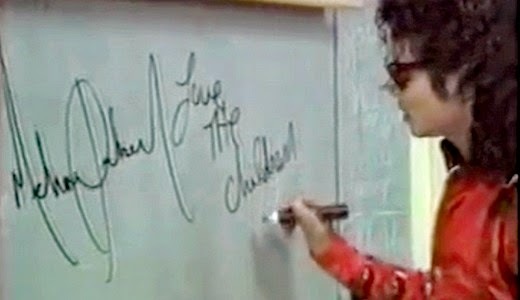 Think of the letters, the spelling, the sound of the name MICHAEL JACKSON. When written, spoken or thought, a person's NAME evokes an entire world of related images, sounds, emotions, memories and ideas. In this world, in the realm of the public, the name is intricately bound to REPUTATION. It is LEGACY. 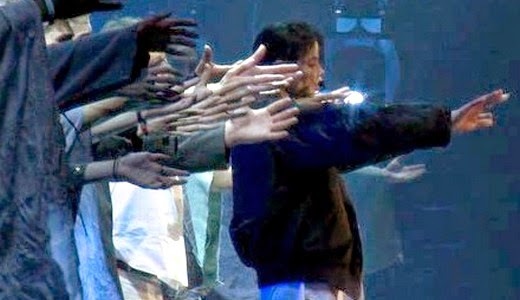 Behind the name MICHAEL JACKSON is the real person, the private man and the public celebrity - and his name conjures up all that the world sees, hears, feels and thinks about him. For us it's much more personal, as we know much more and love him dearly, but everyone knows (or thinks they know) something about MJ. And right now, all of that - his name, reputation, memory and legacy (and thus his heart and all he is/was) are under attack. And we need the public to SEE THE TRUTH. We need them to see through the lies, past the false narratives and beyond the deception. May the highest good be done. 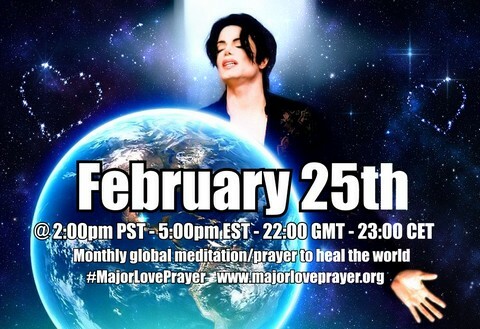 Dear, beautiful MJFam ~ This coming Monday, February 25th, we will again be uniting at the same moment around the world for #MajorLovePrayer - a special moment of global spiritual unity and healing that happens every 25th in honor of #MichaelJackson. This will be the 114th month that we have joined together to send out a major love! As you know, though, this is not a usual month. 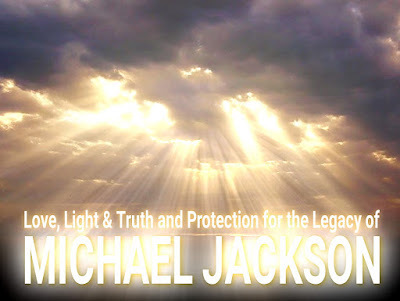 :'( Due to current circumstances, we are going to begin this month a little differently, by focusing an intense, brilliant ray of LIGHT, TRUTH and PROTECTION that will shine nonstop within, around and through Michael's NAME and LEGACY. (This is also something we can do DAILY - will be posting more about this soon.) So, with all the LOVE and strength in our hearts, we will call the LIGHT from Above - and then expand it all into a global wave of major, major, MAJOR LOVE that will bring HEALING, HOPE, PEACE & POSITIVE ENERGY to our planet and all living beings! WE NOW CALL FOR A BRILLIANT, UNWAVERING LIGHT FROM ABOVE to shine brightly with him, through his name, through his voice, through his music, his words, his image. 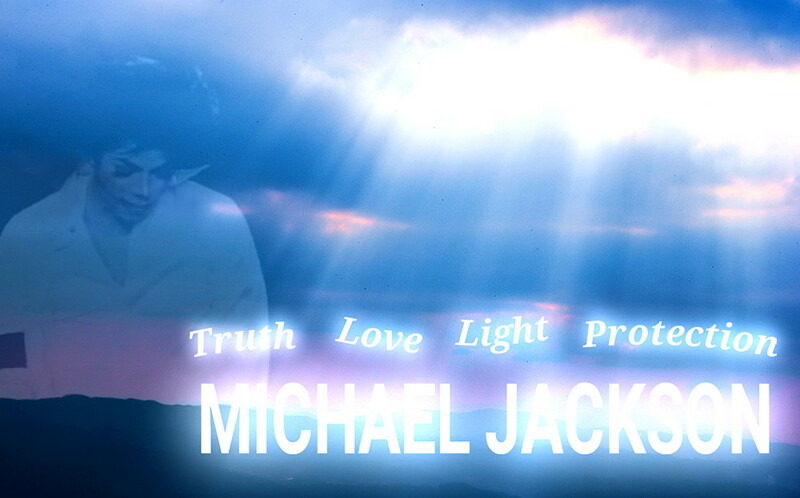 Everything of Michael's carries this light, amplified so that he cannot be misread. VISUALIZE the name MICHAEL JACKSON in giant block letters made of LIGHT that emanates from within. This LIGHT OF TRUTH will now outshine all slander. The LIGHT OF TRUTH will now clear away the lies. Nothing negative can stick to his name or his legacy. HE IS PROTECTED. 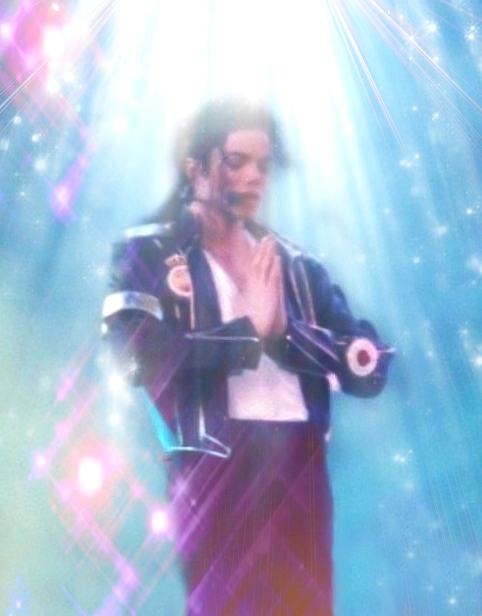 HIS NAME SHINES BRIGHTLY WITH LOVE, PEACE, HOPE and INNOCENCE from this day forward, continuing to inspire and delight, encouraging humanity to reach for our dreams and HEAL OUR PLANET. The real Michael prevails. 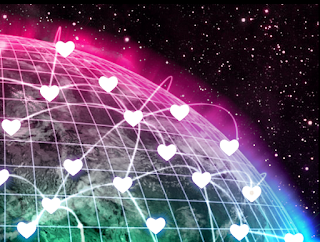 ~ ~ ~ 3) *GLOBAL GRID OF LOVE* - Now it's time to connect and send out a major love (like we do every month)! 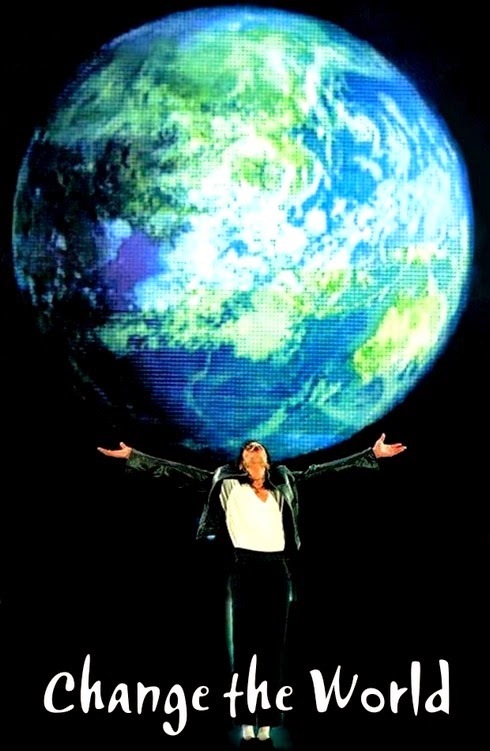 We are together right now, holding this light for Michael across the world, on every continent, in every country, in every realm, so reach out with that all that LOVE in your heart to your brothers and sisters across the planet. 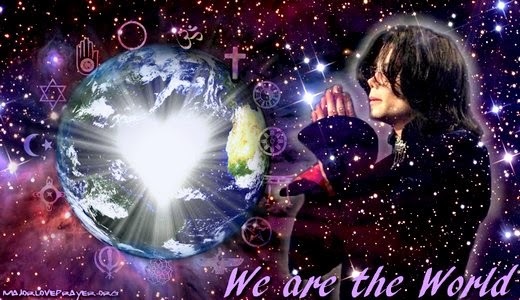 We reach out our hands spiritually to each other and encircle the Earth with a global grid of MAJOR LOVE, each of us a glowing point of light and love energy, connected to the next and so on. We are not far away. WE ARE ONE, as the Earth is ONE. As LOVE makes everything ONE in higher consciousness. ~ ~ ~ 4) *SENDING OUT A MAJOR LOVE* - Now feel the love expanding, expanding, filling the entire world, touching every heart and HEALING THE WORLD from the inside out. Through the ocean and deserts, in mountains and plains, ALL IS LOVED. We love you! Everyone, everything! Every animal, plant, every molecule is within this MAJOR LOVE. Nothing is left out. Nothing is left unchanged by love. All is LOVE. Hold this vision and this knowing as long as you can, for several minutes if possible, then allow it to settle upon the earth and be carried in the wind. Let it fly free... Let it remain available to all who need it, who are suffering or grieving, who are in pain or seeking inspiration to do good and #MakeThatChange. Please join us this FRIDAY, JANUARY 25 - We're sending out a MAJOR LOVE! 2) When you are ready, focus your mind on PARK CITY, UTAH. Visualize the movie theater at Sundance and surrounding area (map link), or just hold a general concept of its approximate location in your mind. It doesn't have to be exact. We are ALL focusing there now.... WITH LOVE. Imagine a beautiful, BRILLIANT WHITE LIGHT shining, glowing, sparkling and filling the area. Within this Light ALL IS OKAY. ALL IS LOVE. Know that this LIGHT is from Above (...God/Christ/Love/Higher Power...) and it easily transcends lies, greed and deception. It illuminates the TRUTH and helps all to see it. It cleanses away all falsehoods. It PROTECTS the innocent and has the power to transform any earthly situation into what is best for the HIGHER GOOD. 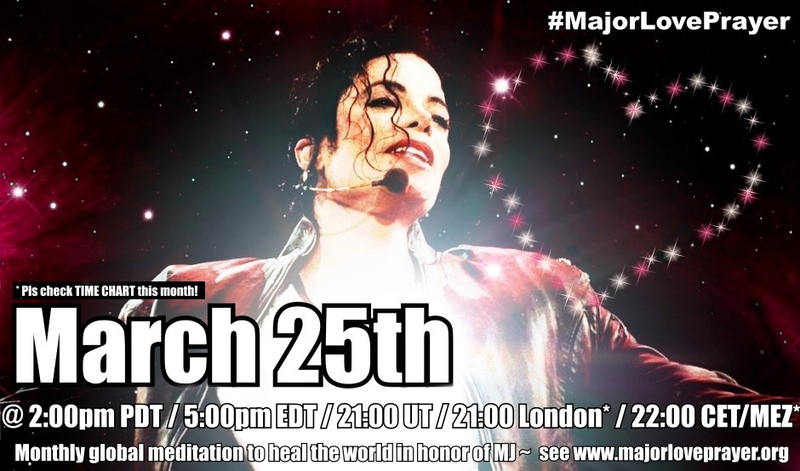 We ask that this is now achieved and that Michael's legacy of love and of healing the world is protected and shining, now and into the future! Hold this LIGHT here in your mind and heart for a few minutes if you like, until you feel all is part of LOVE. 3) Next, this LOVE expands.... expands... The LIGHT and the LOVE grow past the film festival, past the town, through nearby Salt Lake City (where tomorrow's film screening will be)... It grows and encompasses the entire state, then the country, expanding outward in all directions. 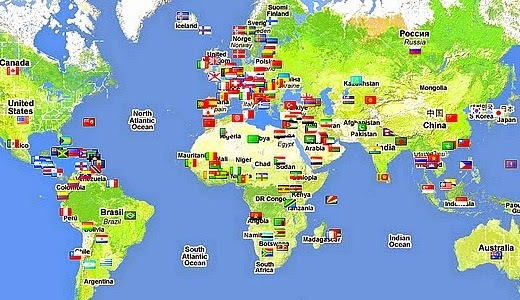 It soon fills the continent, and expands and expands across the oceans, traveling across each continent until the entire the world is SHINING! WE'RE SENDING OUT A MAJOR LOVE! ♥ ♥ ♥ May EVERY ATOM be bathed in MAJOR LOVE. May all suffering be comforted. May every heart be touched and turned to LOVE. Visualize waves of LOVE and LIGHT, of TRUTH and COMPASSION and HEALING now filling every continent, across every ocean, in the air, in the sea, in the forests, cities and deserts. ALL LIVING BEINGS are within this MAJOR LOVE. All are ONE. ALL SOULS are HEALED. All will be guided to HEAL THE WORLD and to take the right steps according to their mission and talents. This we ask and this is now a reality.